On Saturday 10th October 1942 Johannes Lange, pictured below, who was the town photographer routinely called upon to take photographs at Colditz, was asked to take pictures of the prisoners as was customary in the circumstances. 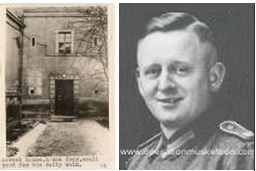 The two officers were being held in the overflow solitary confinement cells down in the town, just a short walk away, and their photos show them standing outside the main prison entrance (the cells to the adjoining pre war courthouse – see below). The ‘Other Ranks’ were being held in the Arrest Cells at the castle itself. These photos were taken between the Arrest Cells and the Guard House in front of the entrance to the POW yard. One can make out the steep slope of the ground as the causeway rises up the contour of the hill.